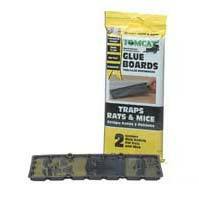 Tomcat rat glue boards are more effective than ever at catching rats. The non-toxic glue is both the bait and capture source. Tomcat rat glue boards are sold in packs of 2. Choose between the plastic valuepak or the box packaging options.